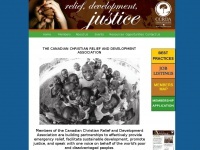 Canadian Christian Relief and Development Association (CCRDA) is a group of Christian agencies who are dedicated to excellence in the practice of their charitable work. Keywords: Christian Religious Projects Justice Poverty Health Education Children Youth Hiv and Aids Farming Development Relief Disease Displaced People Refugees Disaster. The web server used by Ccrda.ca is run by OSM Networks Inc. and is located in Lansing, USA. On this web server 37 other websites are hosted. The language of those websites is mostly english. The websites of Ccrda.ca are served by a Apache web server using the operating system Unix/Linux (Unix). The software used to serve the webpages was created by using the programming language PHP. The website uses the latest markup standard HTML 5. The website does not specify details about the inclusion of its content in search engines. For this reason the content will be included by search engines. Server provider: OSM Networks Inc.